Heat the olive oil and butter in a medium sauce pan. Add shallots and garlic and saute until soft for five minutes on medium heat. Adjust the heat so not to burn the shallots and garlic. Add the chopped cooked chestnuts and stir well. Add the stock and cook the chestnuts until soft. Keep adding more stock if it is too low. You need enough liquid to puree the chestnuts. Puree the chestnut mixture with a blender or food processor. You can add more liquid (water or stock) if the chestnut mixture is too thick to be pureed. Pour the pureed chestnuts into a clean pan. Put the chestnut puree on medium heat and add the soy milk and combine well. Add salt and pepper. Turn off the heat and add heavy cream. 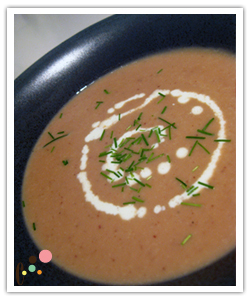 Serve in a bowl with fresh chives and a dash of heavy cream on top. There are many ways to peel and cook chestnuts. But this is the really easy way.